2008 Jan. 28: Russia launched an Ekspress-series communications satellite in the pre-dawn hours of Monday. A Proton-M rocket equipped witha Briz-M upper stage lifted off on Jan. 28, 2008, at 3:18:00 Moscow Time from Site 200 at the Baikonur Cosmodrome. It carried the Ekspress-AM33 satellite toward a geostationary orbit. The spacecraft was developed by NPO PM of Zheleznogorsk for Russia's Satellite Communications Company, RSCC. The Russian space agency, Roskosmos, reported that the Briz-M upper stage and its payload successfully separated from the rocket and continued their path toward their final orbit. The 2,600-kilogram Ekspress-AM33 satellite was to be placed at 96.5 degrees East longitude above the Equator, where it was expected to function for 12 years. The launch of Ekspress-AM33 was previously expected in September 2007. 2008 Feb. 11: After a one-day delay on the launch pad, Russia delivered a commercial communications satellite for a Norwegian customer. A Proton-M rocket equipped with a Briz-M upper stage lifted off on Feb. 11, 2008, at 14:34 Moscow Time from Site 200 at the Baikonur Cosmodrome. It carried the 1,940-kilogram Thor-5 (Thor-2R) communications satellite for Telenor Satellite Broadcasting based in Oslo, Norway. of the Briz-M. According to the Khrunichev enterprise, the Proton rocket manufacturer, the vehicle successfully reached its initial parking orbit. Separation between the Briz-M and THOR-5 was scheduled for 23:56 Moscow Time on Feb. 11, 2008, or nine hours, 22 minutes, 50 seconds after liftoff. The THOR-5 spacecraft is based on the STAR 2 platform developed by Orbital Sciences Corp based in Dulles, Va, USA. It is intended to provide broadcasting and interactive services in the Nordic region, Europe and the Middle East. The satellite is equipped with 24 active Ku-band transponders: 15 for FSS and 9 for BSS; 5 active BSS transponders available through steerable antennas. The spacecraft was expected to be positioned at 1 degree West longitude and had an anticipated service life of 15 years. The mission was delayed from the fourth quarter of 2007, Feb. 6 and Feb. 10, 2008. 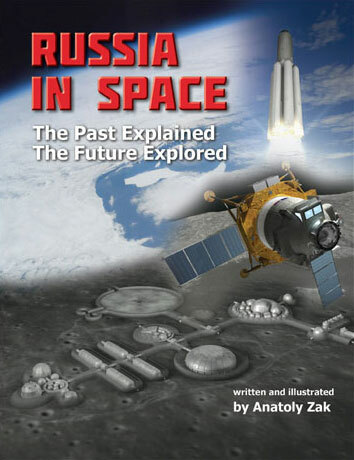 2008 March 15: The workhorse rocket of the Russian space program left its cargo in a useless orbit just half a year after a previous failure. A Proton-M rocket with Briz-M upper stage lifted off from Baikonur at 02:18:55 Moscow Time, carrying the AMC-14 communications satellite. According to International Launch Service, ILS, which markets the vehicles around the world, preliminary flight information indicated that the anomaly occurred during the second burn of the Briz-M upper stage. According to the Russian Space Agency, Roskosmos, at 02:28:41 Moscow Time, the payload section, including the satellite and the Briz-M upper stage separated from the third stage of the rocket and continued flight on a suborbital trajectory. The Briz-M then fired for the first time placing itself and the payload in the initial parking orbit. However during the second burn, Briz-M fired for 32 minutes, shutting down 2 minutes 13 seconds ahead of schedule, Roskosmos said. The AMC-14 separated from the upper stage and remained under control, however its orbit had an altitude of 28,000 kilometers, instead of planned 36,000 kilometers, according to Roskosmos. A similar failure took place in March 2006, when the rocket failed to deliver ARABSAT 4A spacecraft. Russian State Commission began the process of determining the reasons for the anomaly. In parallel with the State Commission, ILS formed its own Failure Review Oversight Board. The FROB was to review the commission's final report and corrective action plan, in accord with U.S. and Russian government export control regulations, ILS said. The mission was previously planned for the second quarter of 2006 and December 2007. On April 21, 2008, the International Launch Services announced that "the cause of the failure has been traced to rupture of the gas duct between the gas generator and the propellant pump turbine in the Briz-M main engine. The most probable cause of the gas duct rupture was due to the combined effects of duct wall erosion, high temperatures and prolonged low frequency pressure fluctuation in the duct." According to the company, its Failure Review Oversight Board (FROB) was to meet in Moscow on April 25, 2008, to commence an in-depth review and assessment of the Russian State Commission investigation. In addition to propulsion and industry experts and representatives of the insurance industry, the FROB was also to include customer representatives. Addressing the larger picture of actions, Khrunichev initiated a broad-based quality initiative, ILS said. Key elements of the plan included overall assessment and review of the Quality Management System, assessment of changes to increase overall reliability, evaluation of all production factors affecting quality and increased customer visibility into product and process quality. Owner of the AMC-14 satellite, SES AMERICOM, announced that it was declaring the bird a total loss. However, there were conflicting reports on the future fate of the satellite and possible efforts to deorbit the vehicle. 2008 June 27: A Proton-K with a Block DM upper stage rocket blasted off Site 81 in Baikonur Cosmodrome, Kazakhstan, on June 27, 2008, at 03:59 Moscow Time, the official Russian ITAR-TASS news agency reported. According to the Russian Space Forces, VKS, the launch went as scheduled and at 04:06:30 Moscow Time, the vehicle established radio-contact with ground control. The separation between the payload and the upper stage was scheduled for 10:37 Moscow Time on June 27, 2008. Although the nature of the payload in this mission was not officially announced prior to launch, Proton rockets have long been known to deliver two types of military satellites: communications and early-warning satellites. Both are delivered into geostationary orbit 36,000 kilometers above the Earth surface. Following this launch, however, the semi-official Interfax news agency quoted Aleksei Kuznetsov, secretary of Defense Minister confirming that the purpose of the launch was to replenish the SPRN early-warning system. The network is known to employ 71Kh6 satellites equipped with infra-red sensors to detect exhaust plumes of missiles. 2008 Aug. 19: Russia's workhorse Proton-M rocket conducted its first commercial mission Tuesday after the failure in March. An enhanced version of the Proton-M rocket with a Briz-M upper stage, lifted off from Pad 39 at the Baikonur cosmodrome on Aug. 19, 2008, at 4:43 local time (22:43 GMT on Aug. 18), carrying the Inmarsat-4 F3 communications satellite. Nine hours and three minutes after the liftoff, the satellite separated from the upper stage of the launch vehicle in a geosynchronous transfer orbit, the International Launch Services, ILS, announced. The Inmarsat-4 F3 satellite, a Eurostar 3000GM model built by EADS Astrium, is expected to go into service at 98 degrees West longitude, where it will deliver mobile broadband services over the United States for Inmarsat of London. The F3 satellite, weighing more than 5900 kg, was to be one of the heaviest commercial payloads to date for Proton. According to the manufacturer, the spacecraft was among the most sophisticated commercial satellites ever launched and 60 times more powerful than its predecessors. The contract for the launch was announced on Aug. 7, 2007. The mission was previously planned for March, April, May and Aug. 14, 2008, 04:46 Baikonur Time. After a Proton left the AMC-14 satellite in a useless orbit due to the failure of the Briz-M upper stage in March, the Inmarsat launch became the "return to flight mission" for Proton-M.
On Aug. 4, 2008, ILS announced that the mission has been delayed to allow time to replace and retest the launcher's electrical component. During pre-launch testing in Baikonur, a problem was discovered with the flight computer on the Briz-M upper stage. The vendor-supplied flight computer was replaced over the weekend of Aug. 3. To ensure mission success, Khrunichev specialists had to check out the new component. According to ILS, the mission would be delayed by a matter of days and a new target launch date would be announced later that week after testing is completed. 2008 Sept. 20: A Proton rocket successfully carried the Nimiq-4 satellite into orbit for Telesat of Canada, an International Launch Services (ILS), which markets the vehicle around the world said. The Proton-M rocket with Briz-M upper stage lifted off from the Baikonur Cosmodrome on Sept. 20, 2008 at 03:48 local time (or 5:48 p.m. EDT, 21:48 GMT on Sept. 19). After a 9-hour and 11-minute flight, the 5-ton satellite was released into geosynchronous transfer orbit. Eventually, the engineers at Astrium were expected to move the satellite to 82 degrees West longitude, where it was designed to deliver direct-to-home television across Canada. The satellite, built by EADS Astrium, was based on the Eurostar 3000 bus. The contract for the mission was announced on Feb. 7, 2006. After the Inmarsat-4 F3 launch in August 2008, the mission was postponed from Sept. 17 to Sept. 19, 2008. On Sept. 17, 2008, ILS announced that the launch was postponed for 24 hours to replace an avionics unit on the first stage of the Proton-M rocket which showed anomalous signature during routine pre-launch testing. The next attempt was re-scheduled for Sept. 20, 2008, local time in Baikonur. 2008 Sept. 25: Russia launched trio of navigation satellites for the nation's GLONASS global positioning system. A Proton-M rocket with a Block DM upper stage lifted off from Baikonur Cosmodrome on Sept. 25, 2008 at 12:49 Moscow Time. It carried three Uragan-M (GLONASS-M) satellites, which were successfully delivered into the planned orbit at 16:20 Moscow Time, a representative of the Russian space forces said. The mission was previosuly expected in July 2008. 2008 Nov. 6: A Proton-M/Briz-M launch vehicle successfully lifted the Astra-1M satellite into orbit, the International Launch Services, ILS, announced. The Proton vehicle lifted off from Pad 39 at the cosmodrome at 02:44:20 local time (20:44 GMT, Nov. 5). After a 9-hour-12-minute mission, the launcher released the satellite into a geosynchronous transfer orbit. The satellite will eventually go into operation at 19.2 degrees East longitude for SES ASTRA of Luxembourg. The design of the ASTRA 1M satellite is based on the Eurostar 3000 bus by EADS Astrium of France. The mission was postponed from Oct. 31, 2008, 03:30:00 Baikonur Time and Nov. 3, 2008. 2008 Dec. 10: Russia launched the first satellite for Canada's newest satellite operator. The A Proton-M/Briz-M, lifted off on Dec. 10, 2008, at 16:43 Moscow Time (19:43 local, 13:43 GMT) from Pad 39 in Baikonur Cosmodrome. It carried the Ciel-2 satellite for the Ciel Satellite Group of Toronto, Ontario. The first three stages of the Proton used a standard ascent trajectory to place the Briz-M fourth stage and the Ciel-2 satellite into a suborbital trajectory. From there the Briz-M placed itself and the spacecraft into a circular parking orbit. Following four additional burns of the Briz-M, the satellite was to be injected into a geostationary transfer orbit. Separation was expected approximately nine hours, 12 minutes after a liftoff in the 35,603 by 5,597-kilometer orbit with the inclination 19.5 degrees toward the Equator. The satellites was designed to use its own engines to reach its assigned orbital position of 129 degrees West longitude over the Equator. SES AMERICOM Inc., a minority partner in Ciel, was the contracting agent for the launch arranged by the International Launch Services. The contract for the launch was announced on Feb. 15, 2007. At the time, the launch was expected at the end of 2008. Ciel 2 is a Spacebus 4000 C4 model satellite, the largest Spacebus class satellite built by Alcatel Alenia (Thales Alenia), with a mass of 5,575 kg (5,561 kilogram according to December 2008 ILS data). The high-powered spacecraft equipped with 32 Ku-band transponders and a projected lifespan of 16 years was designed to deliver high-definition and other TV services throughout Canada and the larger North American market, with DISH Network Corp. as its "anchor customer." 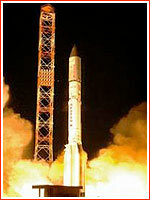 2008 Dec. 25: Russia launched its second mission of 2008 to complete the national global navigation system, GLONASS. A Proton-M rocket with a Block DM-2 upper stage lifted off from Baikonur Cosmodrome on Dec. 25, 2008, at 13:43 Moscow Time. Block DM and a trio of GLONASS-M satellites separated from the third stage of the Proton at 13:53 Moscow Time, reaching an initial parking orbit. Two firings of the Block DM upper stage inserted the satellites into a 170 by 19,000-kilometer orbit and then to a circular 19,100-kilometer orbit. The mission was previously scheduled for October and November 2008. 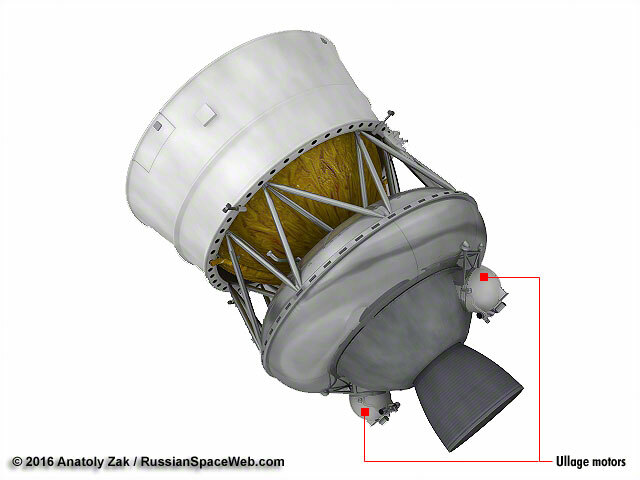 According to the Joint Space Operations Center, JSpOC, of the US Strategic Command, the ullage motor from Block DM-2 upper stage, which delivered this GLONASS trio, exploded on March 27, 2016, around 01:45 GMT, generating 21 trackable fragments. The second motor from the same space tug apparently followed suit between 09:20 and 09:30 GMT on June 1, 2016. That event generated at least 20 fragments which were trackable by 16:00 GMT on June 1, JSpOC announced.